IT departments are paying close attention to developments in cloud computing technology. The cloud offers the promise of large potential savings in infrastructure costs and improved business agility, but all of that doesn't come without its concerns. Number one on that list is security, which frankly, has become a major barrier to implementing cloud initiatives for many organizations. 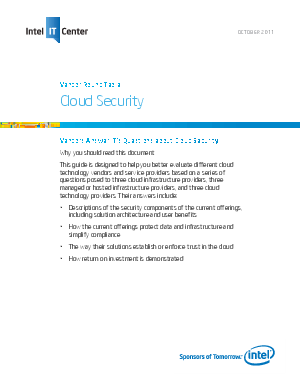 Download Vendor Roundtable: Cloud Security, a guide designed to help you better evaluate different cloud technology vendors and service providers based on a series of questions posed by three cloud infrastructure providers. Don't miss Vendor Roundtable: Cloud Security, you've got cloud security questions, why not hear answers from current vendors to help you evaluate security products and services for the cloud! ?